If we lower our expectations and raise our humanitarianism the future looks very bright. ...has been removed due to negative and unsavory content. Thanks to all those who took part in our Dave White T shirt giveaway. As many of you know 'Asweepay' is one of our sponsored paddlers who represents our mission to take sea kayaking away from the old farts network and the overly organized paddling bureaucrats. It seems there are a few people out there who not only know who Mr White is, but would also wear a picture of him. Chad D - " He taught me how to roll and is my inspiration". Some great smoke blowing that will sit very well with El Blanco. Bruce S - "Stick paddlers stick together"
Ah yes, back in his early years we all new DW as a 'sticky'. Jim F - Always looking for flotsam and good use of the self descriptive word "jinkier". As we are cheap and quite low on the chain, the 3 finalists will go into a hat and one of you will win the Dave White signature T, but all will get something for your efforts. Gentlemen, your prizes are in the mail. "When given the task of producing a program on kayaking, the Outdoors crew jumped at the chance to learn a little about the sport themselves. The crew enlisted the help of the Whitewater Learning Center of Georgia to be their teacher and set out to become master white water kayakers. Graduation: The class two rapids on the upper Chattahoochee River. Sea kayaking, on the other hand, is specially designed for a more relaxed experience than whitewater kayaking. Sea kayaking affords a diversity of opportunities to explore Georgia’s riverine and coastal ecosystems. From the serene vantage point of a sea kayak a paddler’s perspective affords the opportunity to view wildlife and awe at the splendor of Georgia’s waterways. 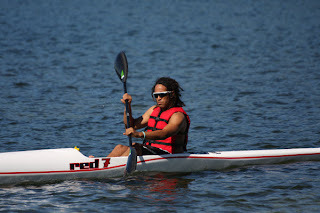 We’ll also learn more about how kayaks are made and an Atlanta kayak club." Just in time for Christmas, we will have our new line of T shirts in store. The first on the shelves are our new Signature Series T's. These depict a member of the SC&K Pro Team on the back with one of their slogans and a signed pocket logo on the front. Comes in an organic natural color with brown ink. The Dave White will be available by Friday. 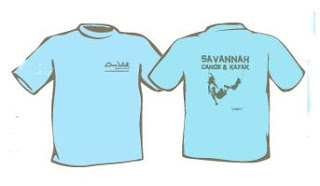 Drop us an email telling us why you want a T with Dave White on it and maybe we'll send you one for free. Trinidad and Tobago paddlers celebrated last week as they feverishly unpacked the container loaded with 25 new surfskis, almost doubling the number of available craft on the island. 22 of the skis belong to the T & T Canoe and Kayak federation and were funded by the Ministry of Sport and Youth Affairs. These boats will be available for anyone to paddle and the Surfski Club and Federation will be running regular open days and coaching sessions to get people hooked on this great sport. Australian school teacher David Sheridan gets an unexpected visitation from the deep. 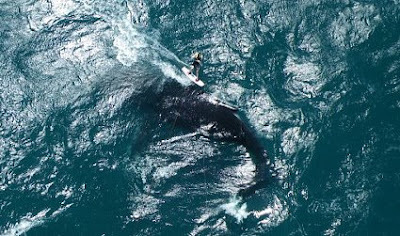 As this amazing picture shows, a huge whale suddenly rose up close to the surface as the 42-year-old New South Wales man was riding his kiteboard - a small surfboard suspended beneath a large kite. Seconds after this photo was snapped remotely by David's camera, mounted on the kite apparatus, the whale flicked up its tail and gave him an almighty blow on the back of his head. Because the camera was programmed to take pictures every 10 seconds it missed the moment when the whale struck David . The Whale was not injured in the encounter. Sea Kayaker magazine this month. We would like to congratulate our competitors on a great win and for maintaining the high degree excellence displayed by all outfitters in our area. 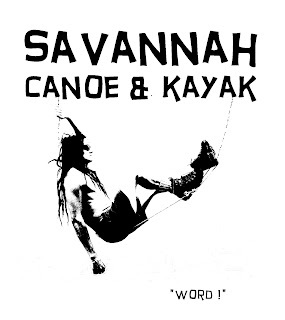 This is positive reinforcement for our whole paddling community. 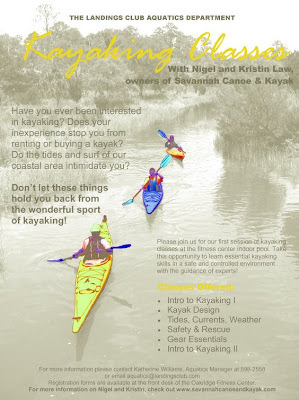 SC&K were not in the pole as we do not advertise in Sea Kayaker magazine. It's an 8 hour drive from Savannah to the place they call Virginia Beach. And to think that just 70 years ago there was but a few old beach houses scattered through-out the miles and miles of dunes. Not any more !. I checked into the seventh floor of Best Western, one of the smaller , shorter hotels along the sea front, now end to end with high rise. It reminded me of Copacabana and Ipanema in Rio De Janiero. But I was not in town for Carnival. This was business with the purpose to complete my Instructor Trainer Certification. 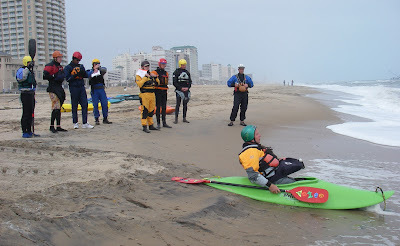 It was also the first official launch of the new ACA Surf Program. The first day was flat as a pancake, which was o.k as we get to do little surfing on this day. For day two and three the shore break kicked in and really made the weekend worthwhile. Demonstration's did not always go as planned and students received hard and constant beat downs during the many launching's for practice and demo sessions. But that is all part of the fun, especially if you are the one watching from the beach. At the end of the weekend we certified three Sit on Top Instructors (L2), One SOT Instructor Trainer and one L3 Instructor Trainer.